This has been a whirlwind week – literally. To start, the weekend was crammed with weirdness. The island was taken over by skateboarders with crash helmets for the annual downhill speed competition. Austin hates all skateboards and scooters so we avoided the spectacle, but heard the crowds gathered to see the rolling daredevils wipe out on the hairpin curves of Upper Terrace. I heard that there were also some Rugby Rats here, but I didn’t see any of that first hand. We were more charmed by the promenade of Scotsmen led by bagpipers to the Casino where they had a ball. Literally. I don’t know how Scotsmen dance. I would have liked to see that but my kilt was at the dry cleaners. Then the Santa Anas kicked up. Waves spewed up over the retaining wall and into the streets. Ferries were halted, trapping visitors for an unexpected extra night. Latitude 38 ‘lectronic has some photos taken by our very own Harbor Patrol. There’s so much people drama going on here all the time that bombastic Nature Drama is rather refreshing in contrast. The winds whipped up the restless hubbub, making hair stand on end with static electricity. I am in a state of suspense, waiting to hear which of my job applications actually becomes real. The girl’s gotta work! In the meantime the trippy web cam at Mt. 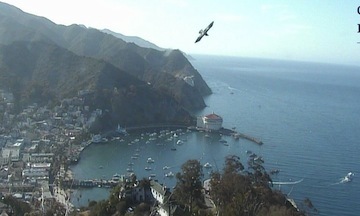 Ada caught this bird in flight over Avalon Harbor. Good timing. This entry was posted on Wednesday, May 7th, 2014 at 5:01 pm and is filed under Uncategorized. Tagged: Avalon, Catalina, Santa Ana Wind, Scotsmen, Skateboard. You can feed this entry. You can leave a response, or trackback from your own site.